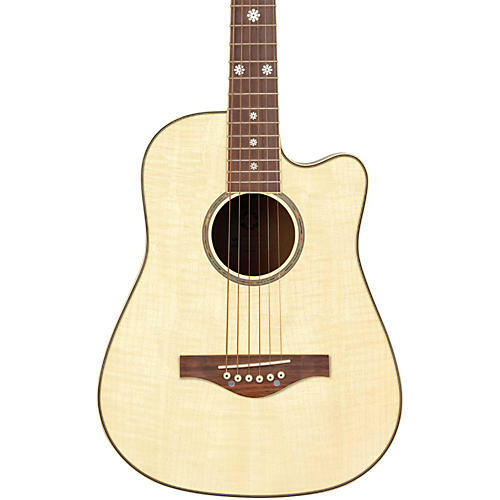 The Wildwood Acoustic is a short scale instrument designed specifically for younger girls with smaller frames, and for older girls looking for a 3/4 size or easily portable guitar. This beautiful guitar is lightweight, it sounds great, and because it’s designed to perfectly fit girls, it's extremely comfortable to hold and to play. The Wildwood features Daisy Rock’s trademark “Slim & Narrow” neck which makes it easier for girls with smaller hands to play. The flamed maple top with mahogany back and sides produces a great sound, and it has a cool vibe that will inspire musicians at any skill level. All Daisy Rock guitars arrive set up, ready to play, and include a limited lifetime warranty. What are you waiting for—get your Wildwood Acoustic guitar and start playing now!